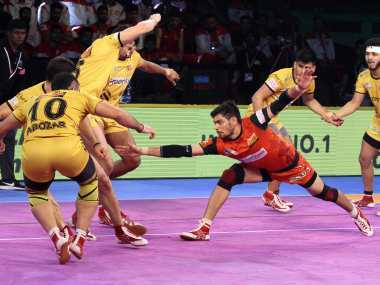 Visakhapatnam: Bengaluru Bulls produced a strong second-half performance to beat Telugu Titans 37-24 in the southern derby of Pro Kabaddi League League in Visakhapatnam on Wednesday. Pawan Sehrawat yet again delivered for the Bulls as he top scored with 13 points while Mahender Singh put in a solid defensive performance and earned himself a high five. Telugu Titans faded away after a bright start as their star raider Rahul Chaudhari couldn’t get going and scored just 4 points. Nilesh Salunke top scored for Titans with 6 points. Telugu Titans remain in hunt for a place in the playoffs but their 3rd home defeat has made it an uphill task. Telugu Titans made a strong start and led 5-1 after four minutes as their defence picked up three tackle points. It took a while for Bengaluru Bulls to get going as Pawan Sehrawat was tackled a couple of times. After 10 minutes, Telugu Titans led 9-5 and were looking in control of the match. But the Bengaluru Bulls fought back in the latter part of the first half as Pawan Sehrawat got going. At the end of the first half, Telugu Titans held a slender two-point lead with the score 12-10. Bengaluru Bulls tied the match at 13-13 in the 22nd minute and then inflicted an all out to take the lead for the first time in 23 minutes. Nilesh Salunke got a two-point raid in the 30th minute for the Telugu Titans as they trailed 18-12. With less than five minutes to go Telugu Titans trailed by just two points but Bengaluru Bulls thwarted all hopes of a comeback as they scored four points in two minutes to lead 28-22. Pawan Sehrawat made a two-point raid in the 39th minute to ensure victory for Bengaluru Bulls as they led 30-22. Bulls inflicted an all out in the second last minute and ran out comfortable winners in the end. K Prapanjan and Parvesh Bhainswal shone bright to help Gujarat Fortunegiants continue their fine form, registering a comfortable 47-37 win against Haryana Steelers in a Pro Kabaddi League encounter. The raiding duo of Prapanjan and Sachin led the charge for Gujarat and both achieved a super 10 each to score 22 points. Parvesh Bhainswal and Sunil Kumar led the defence for Gujarat and contained Haryana raiders throughout the match at the Rajiv Gandhi Indoor Stadium. Monu Goyat top scored for Haryana Steelers with 11 points but couldn't save the team from being knockout of the play-off race. Prapanjan kickstarted the proceedings for Gujarat with a two-point raid in the second minute as they led 4-1. Haryana crumbled under Gujarat's quick start and suffered an all out as early as the 4th minute. Monu tried to restore some parity in the first half with a couple of good raids. However, Gujarat led 18-9 after 10 minutes of play. Naveen made a super raid in the 12th minute to help Haryana reduce the deficit to seven points and trailed 12-19. But the raiding duo of Prapanjan and Sachin were relentless in the first half. Gujarat's defence joined the scoring with a super tackle in the 18th minute. At the end of the first half, Gujarat Fortunegiants enjoyed a 12-point lead. Haryana Steelers defence struggled in the first half as they scored just two tackle points. Gujarat made a two-point raid in the 27th minute to extend their lead to 32-19. They inflicted another all out in the 29th minute to lead 36-20. The last 10 minutes were more about Haryana Steelers reducing the margin of defeat. 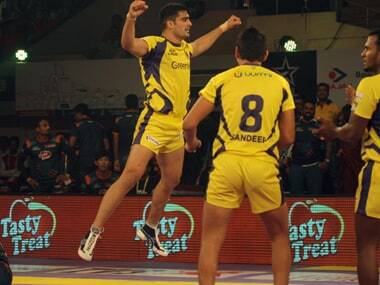 Vikas Kandola made a two-point raid in the 35th minute as Haryana trailed 27-40. Monu then made a two-point raid as Steelers inflicted an all out in the 36th minute to reduce the deficit further by eight points.